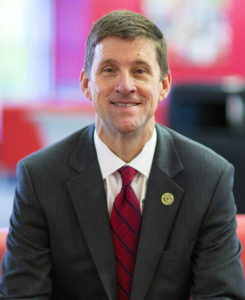 Dr. Hank Bounds, President of the University of Nebraska system. April 28, 2015. Photo by Craig Chandler / University Communications. Recently I had the opportunity to travel the state to talk with Nebraskans about the work of their University and their ideas for the future. Every place I went – Kearney, Grand Island, McCook, North Platte, Scottsbluff, York – I was struck by Nebraskans’ excitement about what’s ahead. And I was again reminded why it’s so important for me to spend as much time as possible meeting with students, faculty and staff who carry out the University’s mission every day and getting a firsthand look at the impact of their work. From agriculture to healthcare, from transforming the lives of 52,000 young people each year to producing the workforce of the future, the University of Nebraska’s reach across the state is significant. I saw that again and again, in one community after another, in conversations with business leaders, community members and policymakers alike. At UNK, I saw impressive changes in the campus’ footprint, like the beginnings of a new STEM education building that will be a game-changer for the rural workforce. I heard about UNK’s strategies to support at-risk students, like those who are the first in their families to attend college, which are having a dramatic impact on retention and graduation rates. In the Panhandle, I joined with business leaders to talk about how we can work together to build a competitive economy for Nebraska’s future, and the University’s vital role in supplying the talent and workforce necessary for growth. I shared stories of Nebraska’s leadership – like in national defense, evidenced by the University’s $92 million contract renewal from the U.S. Air Force to continue our anti-terrorism research. Nebraskans may not know, for example, that a UNO faculty member is a world expert on understanding the psychology of extremist groups like ISIS. And I asked Nebraskans to continue to partner with us, so together we can continue to lead the way into the future. We are on an upward trajectory, but we cannot maintain our momentum without our partners whose support helps ensure affordable excellence at their University. One area where Nebraska and the University have a long tradition of global leadership is agriculture. For almost 150 years, the University of Nebraska and UNL’s Institute for Agriculture and Natural Resources have contributed to advancements in agriculture that have helped farmers and ranchers be more productive and improved the quality of life for people around the world. I got a taste of the breadth of our work in agriculture during my statewide travels, which included stops at UNL’s research and extension centers in North Platte and Scottsbluff. It is remarkable to know that work being done at extension centers in the middle of the country is having an impact around the world. In North Platte, UNL has an entomologist who is a leading expert on the western bean cutworm, one of the top pests of corn. Her studies on the pest and what strategies could be effective against it have improved yields and saved farmers and ranchers untold dollars. And that’s one faculty member among thousands, at one extension center among dozens of University facilities across the state. I could list countless other examples. UNMC experts are engaged in reducing the impact of tractor rollovers, the No. 1 cause of farm injury or death. Our Daugherty Water for Food Global Institute, drawing on the talents of 110 faculty across the campuses, has supported innovations like drone use to capture real-time crop moisture data. Our partnerships with farmers and ranchers to advance agriculture have never been more important. The world’s population is projected to reach 9.6 billion by 2050. Demand for food will double. Food and water insecurity is an urgent humanitarian and international security challenge. Fortunately, the University of Nebraska has the expertise necessary to develop solutions. I could not be prouder of the leadership of our faculty and staff – nor more excited about our opportunities to grow our impact even further.